Seyfert's Sextet (Hickson 79 in Serpens) was actually discovered visually by Edouard Stephan, director of the Marseilles Observatory, in June of 1882 using an 80-cm (31.5-inch) reflector. Even in this large scope Stephan's description reads "Excess, excess, faible" and he logged it as one entry. 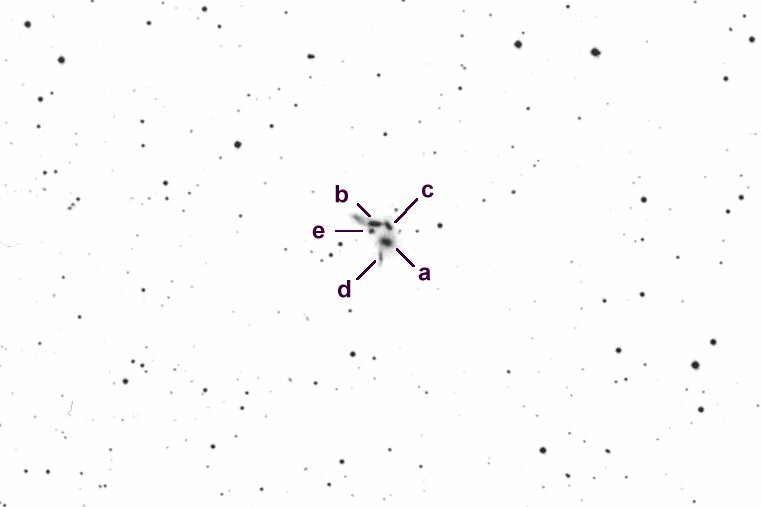 This object received a single NGC designation 6027, but in 1951 Carl Seyfert discovered it was an extremely compact galaxy on a Harvard Schmidt plate. A stunning photo taken with the 200" on Mt. Palomar can be found in Burnham's Celestial Handbook and the group is resolved into 6 components squeezed into a mere 2 arc minutes of sky! Interestingly, Stephan also mentions in his observation that "Švery faint star involved, two very faint stars near." This suggests to me that Stephan may have unknowingly resolved several members but was fooled by their virtually stellar appearance. Actually, one of Seyfert's Sextet is likely a tidally distorted plume of NGC 6027 and both components received the single Hickson entry 79b. In addition, 79d has a discordant redshift three times the other members and is likely a background object. Still, the average 3-dimensional separation of the members is extremely small and this is a more compact group than Stephan's Quintet. You can find Seyfert's Sextet northeast of the distinctive asterism of stars forming the head of Serpens.